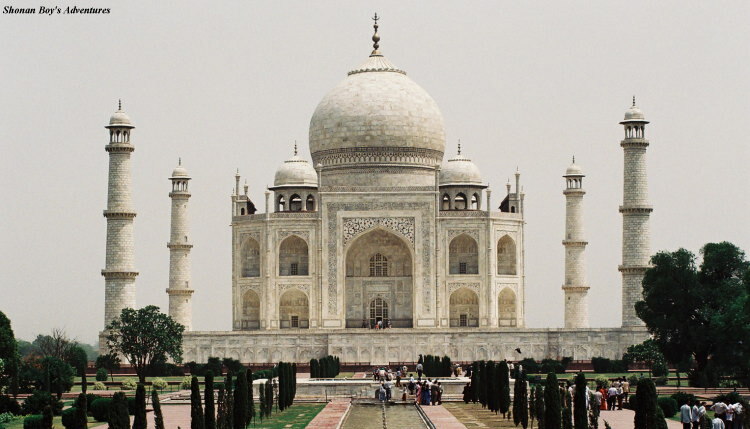 This marble archtecture was built by the Mughal Emperor Shah Jahan as a memorial to his wife, queen Mumtaz Mahal. 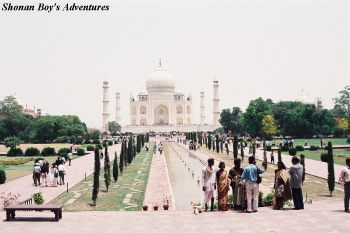 Taj means "queen", and Mahal means "palace or Mumtaz Mahal". Mughal means "Mongolia". Width: 300 meters long, depth: 580 meters long. The height of 4 towers around main building is 43 meters long. A platform of this building is 95 square meters, building itself is 57 square meters, and 67 meters high. Visitors should take off shoes (socks are allowed) at the platform, and check them in advance, and receive numbered tickets. When visitors receive their shoes, they should give tips with numbered tickets. Walls fill beautiful white marbles. Upper pictures are rose. They say that there are about 500 kind of roses in India! Taking photo is not allowd inside. Even inside, there were persistent false guides. We should refuse them with a body language of "No" in a casual manner. Entrance and exit gate. When I visited, a security inspection was required. As well visitors may check their luggages. Cars are not entered up to Taj Mahal. My tour guide and I rode a carriage from this side of 1km. 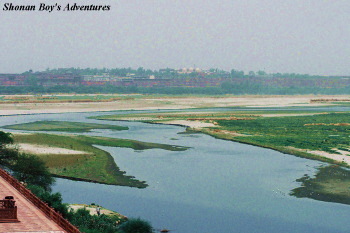 Yamuna River is a branch of the Ganges. 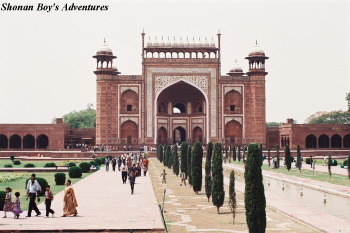 Legend has it that once the construction was completed, Shah Jahan commanded that construction workers should be cut their fingers or killed, etc, so they would never be able to duplicate the structure. 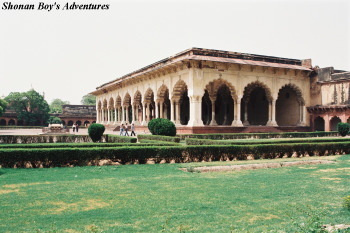 In1565, it was built in Akbar. 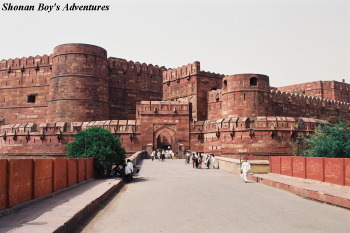 The gate of the front is "Amar Singh Gate". There were persistent merchants in front of the gate. The temperature was 45 degrees Centigrate! It was very hot! 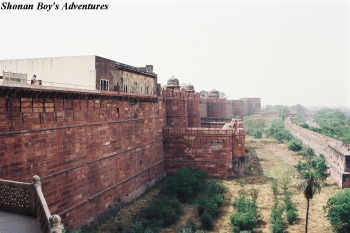 This is a wall of Agra Fort. 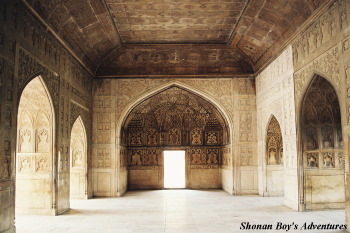 Shah Jahan, a prisoner of his son Aurangzeb in his old age was put in a cell from where he could gaze at the Taj Mahal at a distance, from his cell in the Agra Fort. And Shah Jahan was dead in 1666 (74 years old). Public audience hall. 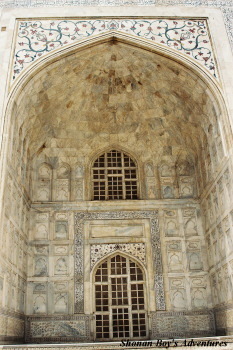 Constructed by Shah Jahan. This is a view from Taj Mahal. 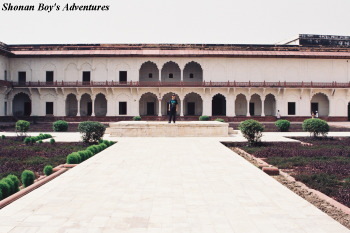 This is a factory near Agra fort, when I went to Agra. 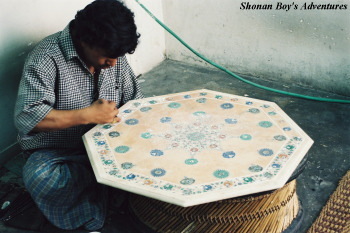 I saw a marble taking the shape of Taj Mahal, and they sold many kinds of marble. US dollar accepted when I visited. 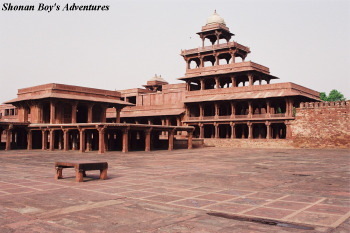 It is located 37km southwest from Agra. 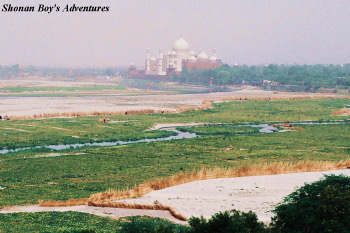 In 1574, Akbar moved his capital here. As there is little water here, he decided to leave it in 14 years. When I visited it, a suspecious man followed us without speaking. After all my tour guide slipped some money into his hand... And he walked away. Troubles happened not only at sightseeing spots, but also at hotel. When I stayed at a hotel in Agra, a rubber knocked on the door of my room for 5 minutes, masquerading a housekeeper around 20:30. I noticed it, and I continued to ignore him.